Kahana Sunset is quite special since it has its own spacious white sandy beach in Keone Nui Bay. 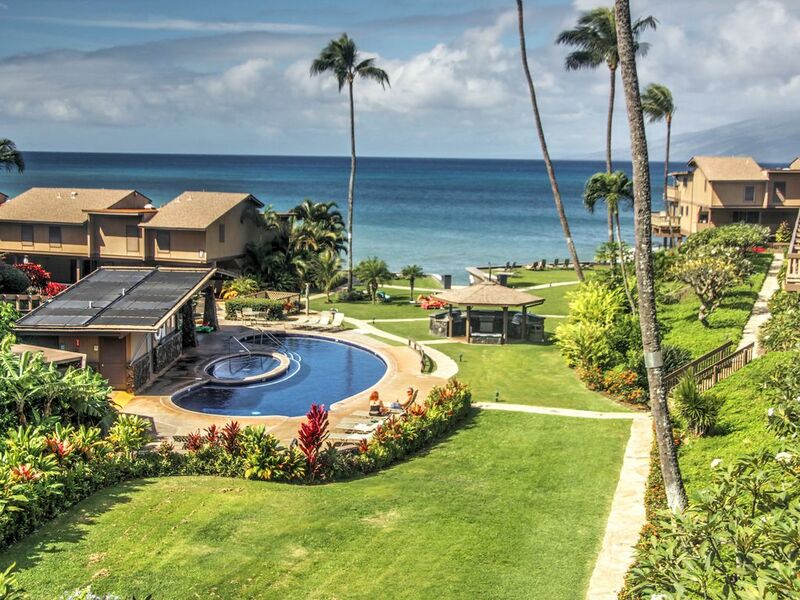 Sitting on our west facing beach you have picturesque views of Molokai and Lanai islands. Since this is a small complex, it is ideal for family vacations and there is something for everyone to enjoy. Loads of lawn and garden space if the pool and beach are not your preference. Both of our lanais give you straight on views of our grounds and sunsets on the water. We're sure once you've spent your first vacation here ... you'll return. Over 50% of Kahana Sunset guests are return guests, many have been vacationing here for over 20 years. The King's, Kathie and John. Our first visit to this complex was on our honeymoon in 1994 and we have been vacationing there once or twice a year ever since. In 2002 we decided we had to purchase our own piece of paradise. Our son Marc and his wife Nicki and our grand kids Gianna and Dante really love this Maui paradise too. We should all be so lucky, G We all live in Windsor, California, which is about an hour north of San Francisco. We chose to buy here because it's a smaller complex, the grounds are well maintained, has it's own beach, great views of Molokai and Lanai, good snorkeling, and it's peaceful. Right in front of the unit. We have FREE wireless capabilities with no password needed. We have a separate wine cooler (54 bottles) which can be used for additional beverages. Big enough to do the whole 'Thanksgiving Dinner'. We ask all our guests to leave any spices they bought, so you should be OK.
Jen-Air range with large oven. Best equipped kitchen other than your house. (3) 3 large flat screen TV's. A sound system that can play your music through bluetooth. We have a small library in the condo and the complex has a larger selection. We have a retractable awning if it gets hot or rains. Great location, nice amenities, uncomfortable beds. The owner sent an email about a week prior to arrival with some helpful information. It wasn't until we arrived that we realized upon entry there is an information book from the property management that has a really good page of info in it that would have been great to have prior to showing up. For example, if you want to check in early or can't get into the condo for whatever reason, you have no information, but it is in that packet - after you get into the condo. The staff onsite for the complex was ultimately useless if needing help with the property, but we weren't there for them, so that wasn't a bid deal. The condo itself was clean, with a beautiful view where we spotted whales each morning. The AC in each room was a nice accommodation and the water was always hot when needed for daily showers by 7 people. Unfortunately the beds leave much to be desired. We utilized all of them with our group, including the pull out couch and every bed was uncomfortable. I personally would have been ok if the pillows were decent, but there was only one for each person and they were all flat and lifeless. The towels for both the beach and showers are either very old or washed in a harsh environment because they are extremely rough. At one point I wiped my face off and laughed because it felt as if I was exfoliating with a face scrub. These are just our opinions and in no way impacted our vacation and should be taken more as feedback for the owner rather than complaints. We had a wonderful time in a beautifully located condo and would return again. The check-in time as listed in the HomeAway House Rules shows 3:00 pm. I will list in our prior-to-arrival letter a phone number for our Property Manager to see if an early entry is available. A majority of the time it isn’t since the cleaning crew needs time to clean the unit from the prior guest which just left at 11:00 am. I’m sorry regarding the beds but this is an example of you can’t please everybody all the time. That is why they make beds from very firm to soft and many in between. We tried to pick a middle ground on firmness. When you listed that 7 guests were in your party and before I accepted your reservation I informed you that the pull out couch isn’t comfortable for adults or large teenagers. I will have the property manager replace the pillows and also inform them of your towel concerns. The condo was great and the people that worked at the site kept the place immaculate. Great view, very nice facilities and well it’s Maui. Great property, perfect for a family vacation. Our 3 year old loved the beach and the kids pool! The condo was very clean and was in a great location. It had everything we needed to vacation as a family. The owners of this place were super friendly, easy to interact with and answered all our questions! We had THE BEST time in Maui! We looked at quite a few condos before we chose this one and we were not disappointed. The view was phenomenal. The condo had everything we could have needed in a kitchen. There was AC when we needed it and the property management company was great! We had an issue with the blender not working and they replaced it that day! The private beach was the best also. It was a two minute walk down and the waves were big enough to body surf in. My 3 year old loved the kiddie pool and since he doesn’t swim yet it took a lot of the stress away know he could stand in the water. We loved it and would go back again in a heartbeat! Oh and the beds and pillows were very comfortable. I slept great and could hear the waves from the master. It was heaven! We had a wonderful vacation and the condo was excellent. It had everything we needed and was very comfortable. Also, had an amazing view! Kahana Sunset is located just below Napili, and we are 8 miles north of Lahaina. Kahana is very quiet and peaceful but we are only only a few miles from the typical tourist attractions. Stays of less than 7 nights are not always available, email owner for availability. Damage waiver is required at $39.00 for coverage up to $2,000.00. Refunds - are available if we are able to rebook your dates.